Discover the allure and natural beauty of Capri by enjoying a boat tour around this enchanting island in southern Italy’s Campania region. The island of Capri is only a short boat ride from Naples, Sorrento or the Amalfi Coast. It’s an excellent day trip, but even better if you can stay longer to explore the natural beauty of this splendid island in the Bay of Naples. The colors of Capri are intoxicating. The brightly colored houses, the rocky cliffs covered in lush plants and wildflowers, the blues of the Mediterranean Sea and the splendid views from the top of the mountains. Yes, the island is known for world-class shopping and elegant restaurants, but it’s the natural beauty of Capri that makes this island so enchanting. One of the best ways to experience this is by taking a boat tour around the island. Whether you rent a private boat or yacht in Campania or simple take one of the many boat tours offered from the port of Marina Grande, this is best way to experience the alluring blue of Capri. The sheer cliffs of Capri slip into the Mediterranean Sea in thousands of shades of blue, from deep electric blue to bright turquoise. The colors shift in the changing sunlight as you tour around the island’s many coves and little rocky beaches. Find the perfect spot and dive right in, surrounding yourself with the cool blue water of Capri. High above you might spot a mountain goat carefully finding its way along the cliff side and you’ll hear the call of the seagulls as they catch a draft and sail in the warm breeze. Not far from Marina Grande, Capri’s largest port, you’ll spot a distinctive red villa set on a beautiful little promontory jutting out into the sea. 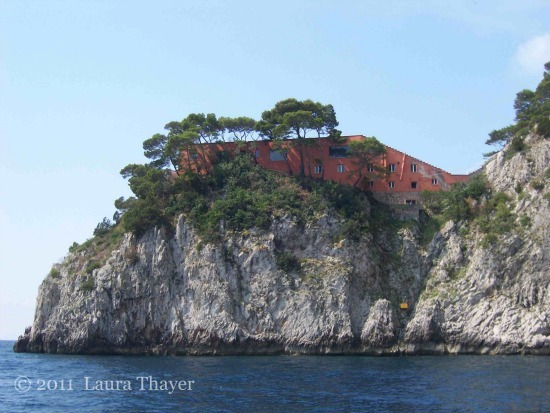 This is the Casa Malaparte, which was the home of the Italian writer Curzio Malaparte. Although its modern architectural style has been criticized since its construction in 1937, it is hard to deny the incredible views from this picturesque spot on the Punta Massullo. 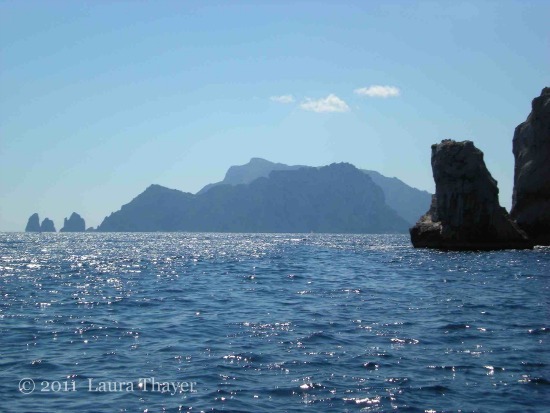 Just around a few more coves you’ll spot the famous Faraglioni rocks, one of the classic images of Capri. These three rocky stacks rise out of the sea up to 360 feet (109 meters) and are one of the islands most beautiful views from the sea or even from the very top of Monte Solaro in Anacapri. Slow down and enjoy the magnificent shades of the blue sea and how it changes around the base of each of the Faraglioni. You’ll spot little boats making their way through the arch in the central Faraglioni called Mezzo. It’s a romantic and thrilling experience if your boat can squeeze through! 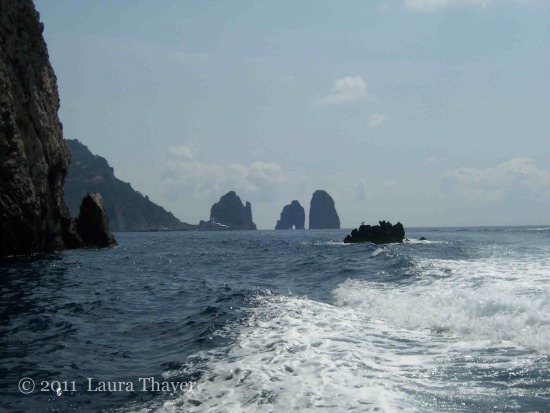 Many larger boats go through the gap between the middle and outer of the Faraglioni, which is just as beautiful. Continuing along the southeastern side of the island you’ll spot the pretty little port area called Marina Piccola, which is an excellent spot to stop off for lunch. On the very southwestern tip of the island you’ll see a pretty pink and white lighthouse marking the tip of the Limmo Peninsula. Here at Punta Carena is a beautiful beach watched over by this lighthouse. This is one of the prettiest places on Capri to watch the sunset in the summer. 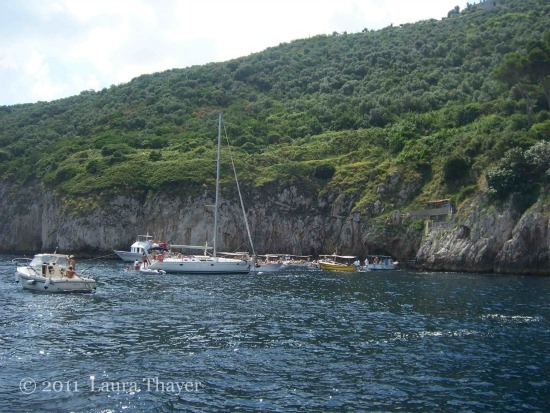 Following the rocky curves, inlets and coves around the island leads you slowly back toward Marina Grande. A gathering of small boats bobbing up and down along a rocky section of the island might catch your attention. 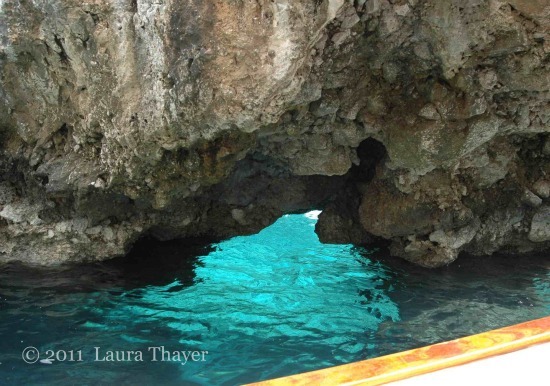 That’s the entrance to the famous Grotta Azzurra, or Blue Grotto, on Capri. 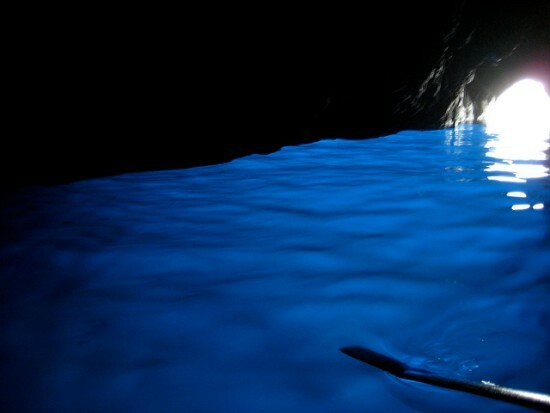 Inside the water is a magical shade of blue created by the refraction of light entering the grotto. 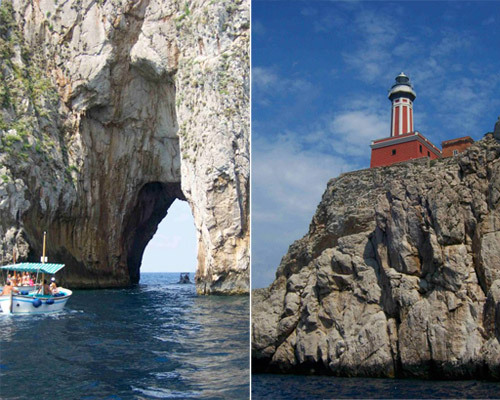 It is said that nowhere else on Capri is the water as spectacular as inside the Blue Grotto, and a glimpse inside is the perfect way to end your boat tour around the island of Capri!